Gotu Kola (Hydrocotyle or Centella asiatica) is a herb that revitalizes the brain, raises concentration and improves memory. In high doses, Gotu Kola also functions as an aphrodisiac. With these dried Gotu Kola leaves, you can brew a strong tea. The packaging contains 80 grams of dried and shredded Gotu Kola leaves. Gotu Kola (Centella Asiatica) is known throughout Asia for its delicious taste and medicinal properties. Gotu Kola has calming effects. Consuming Gotu Kola revitalizes the brain and improves concentration and memory. In high doses, Gotu Kola also functions as an aphrodisiac. With these dried Gotu Kola leaves, yo ucan brew your own tea. For a nice cup of tea, dissolve half a tablespoon of Gotu Kola in hot water. For stronger tea, let 30 grams of Gotu Kola simmer in hot water for about 2 hours, keeping the lid on the pan. Then use a sieve to filter out the leaves and add sugar or honey to taste. Start out by drinking a small cup of this tea. 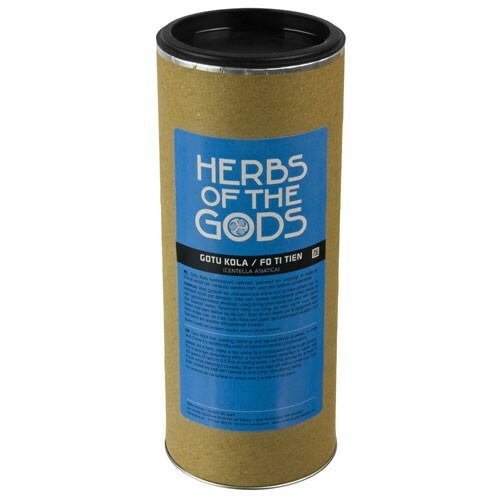 The herb Gotu Kola is part of the apiaceace family, just like cumin, parsley, fennel and cilantro. Guto Kola originates from places with warm, humid climates, such as South East Asia, India, Japan, China, South Africa and Sri Lanka. In these countries, Gotu Kola has a rich cultural tradition. In China, it is referred to as “fo ti tien” and has been used for hundreds of years for its medicinal properties to treat skin problems, wounds and varicose vains. In the ayurvedic tradition, Gotu Kola is often called “mandukaparni” or frog-leafed, because it is often found in marshy areas. Nutritious Gotu Kola tastes both bitter and sweet. In Southeast Asia, it is often eaten raw in salads or drunk as a juice. It is also available as extract and in powder form. In the west, Gotu Kola is often eaten as a dietary supplement. Many believe Gotu Kola to have positive effects on blood vessels, especially when combined with blueberries. In addition, Gotu Kola is thought to improve brain functions. In Sri Lanka, one piece of folk wisdom states that elephants have such strong memory because their diet contains so much Gotu Kola.